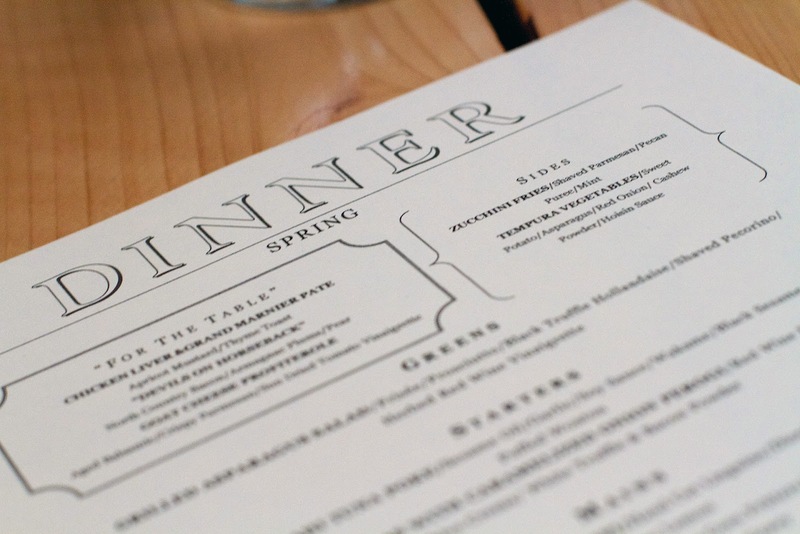 The best part about farm to table restaurants is that the menu is always changing based on what's seasonally available. It's a really good excuse to keep going back. 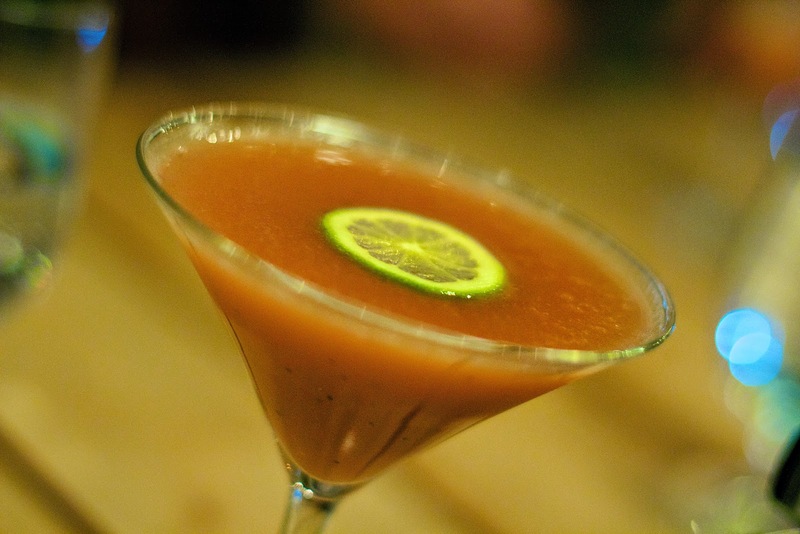 Not that you need to an excuse to become a regular at Bailey's Backyard in Ridgefield. The food and drink is always killer. As luck would have it, we were treated to a special Spring tasting dinner along with some of our other food blogging buddies. Once again Owner Sal Bagliavio, Chef Forrest Pasternack, Bryan Walsh and the entire Bailey's crew outdid themselves with a sampling of four new cocktails and five multi-dish courses. You're going to need to loosen your belt just reading about this non-stop feast. 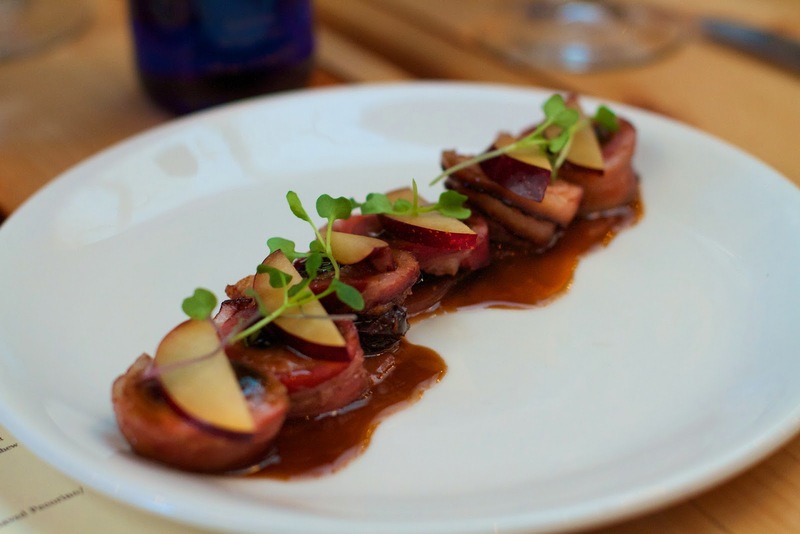 "Devils on Horseback" featured north country bacon wrapped around Armagnac plums, topped with a thin crisp slice of pear. It was the perfect mix of sweet, savory, salty and crisp. It was a melt-in-your-mouth delight. It was one of my favorites. Really, how could it not be? Bacon! 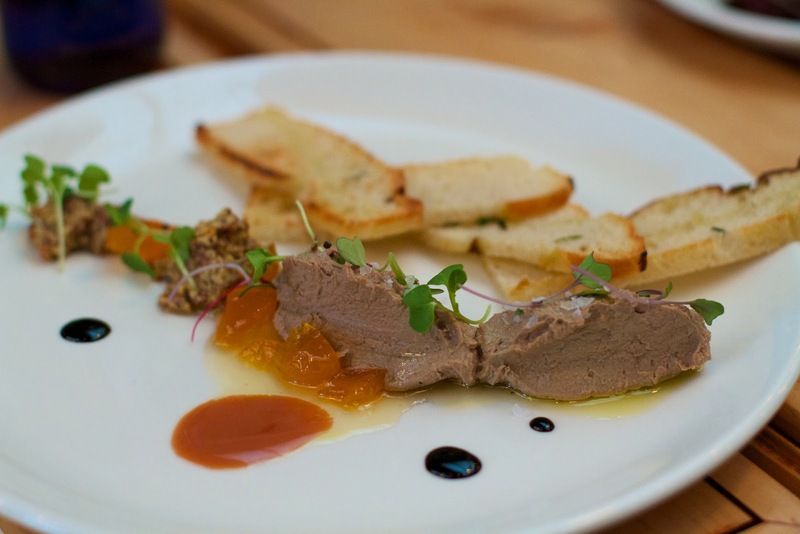 Chicken Liver + Grand Marnier Pate with apricot mustard and thyme toast. Pate is a pretty intense flavor and I have to admit I'm not really a fan. I keep trying it, but it's just not my thing. I did like how the sweetness of the apricot and spiciness of the whole grain mustard balanced out the intense pate flavor. It was still a little too intense for my palate but if you're into pate, I think you'll totally dig this dish. 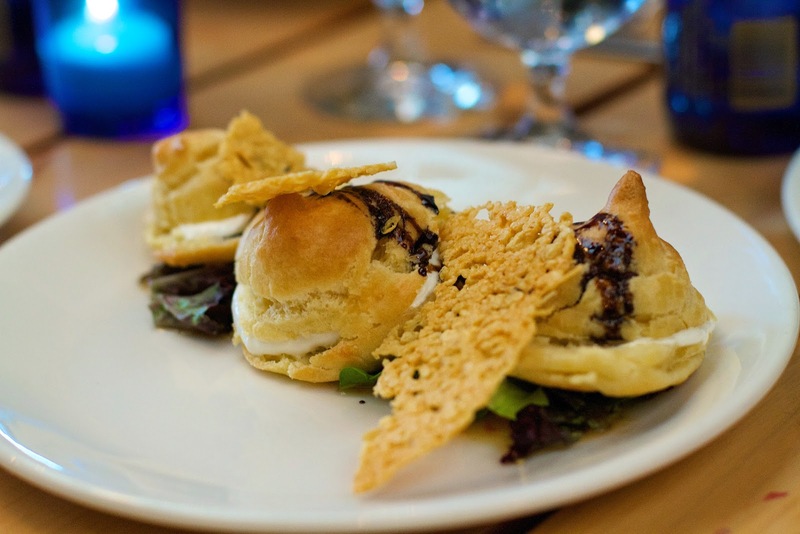 Goat Cheese Profiteroles with aged balsamic, sun dried tomato vinaigrette and crispy Parmesan. Profiteroles are classically a sweet dessert. In this unique twist your brain knew it would be savory, but your eyes kept telling your brain it was going to be sweet. While not my favorite, I will say that the goat cheese was incredibly light and airy. 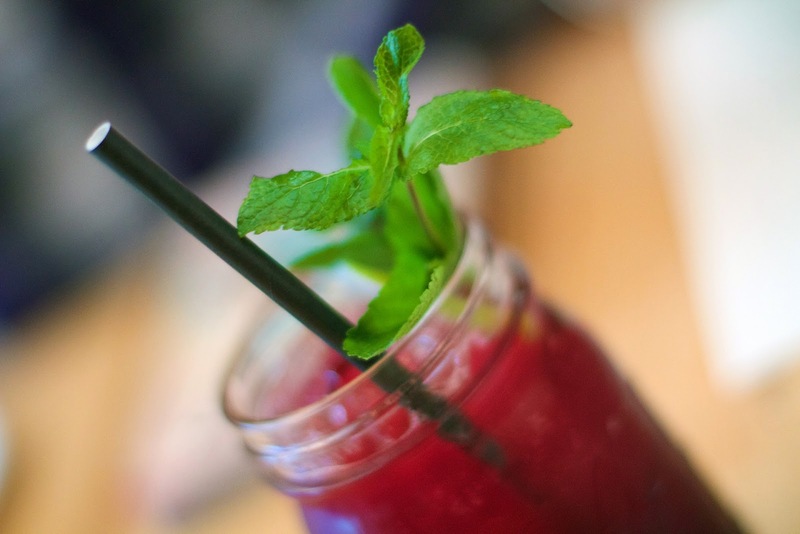 Six Toed Cat made with house-infused blueberry and mint rum, lime, fresh mint, and ginger beer. And yes, it was named as an homage to the polydactyl Hemingway cats. We all agreed this would be perfect to sip on a summer evening as you watch the sun set from your wrap-around front porch. 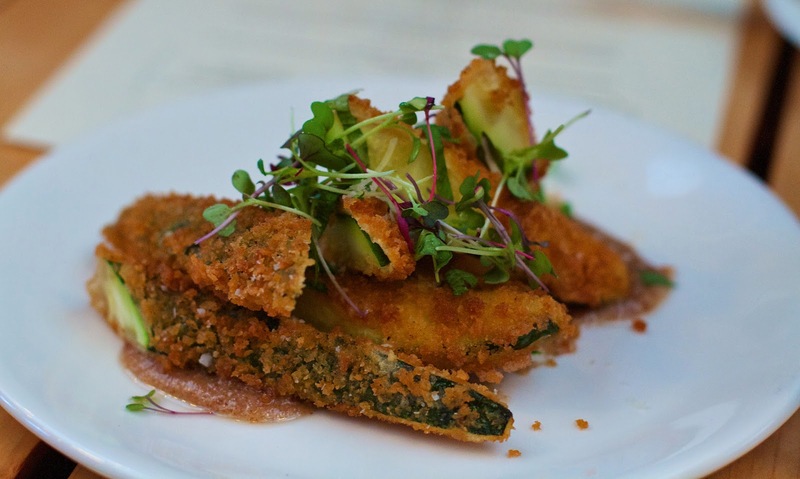 We also shared a couple of new vegetable sides - Zucchini Fries with shaved parmesan, pecan pure and mint, and Tempura Vegetables (sweet potato, asparagus and red onion) dusted with cashew powder served with hoisin sauce. 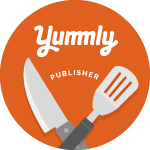 I loved the nutty pecan powder with the fresh mint on the hearty zucchini fries. I ate more than my fair share. 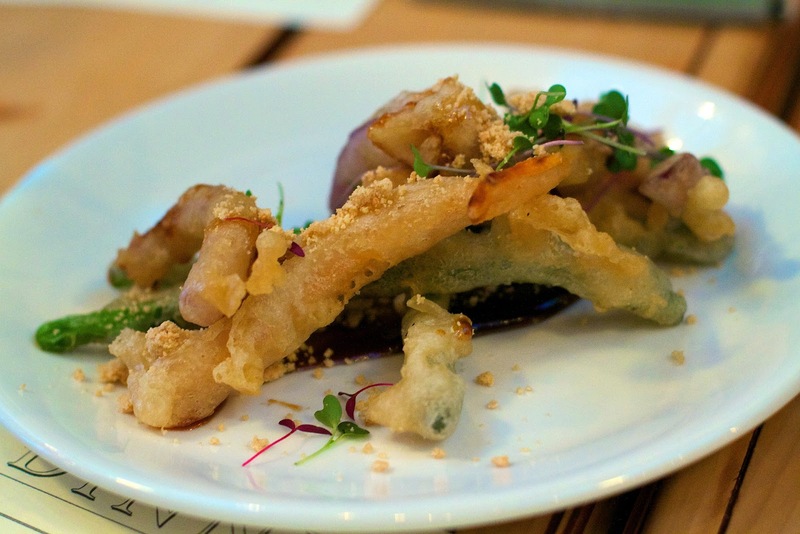 The tempura vegetables had a light and crispy coating and were still naturally firm. 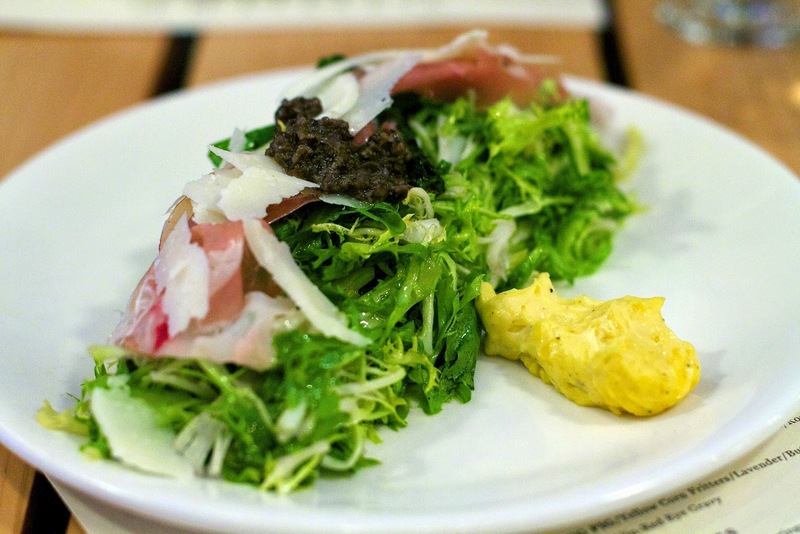 Grilled Asparagus Salad with frisee, proscuitto, black truffle hollandaise, shaved pecorino, herbed red wine vinaigrette. The salad was fresh and tangy and the hollandaise wasn't overly heavy but a nice creamy compliment to the crisp, fresh vegetables. It sung of spring. 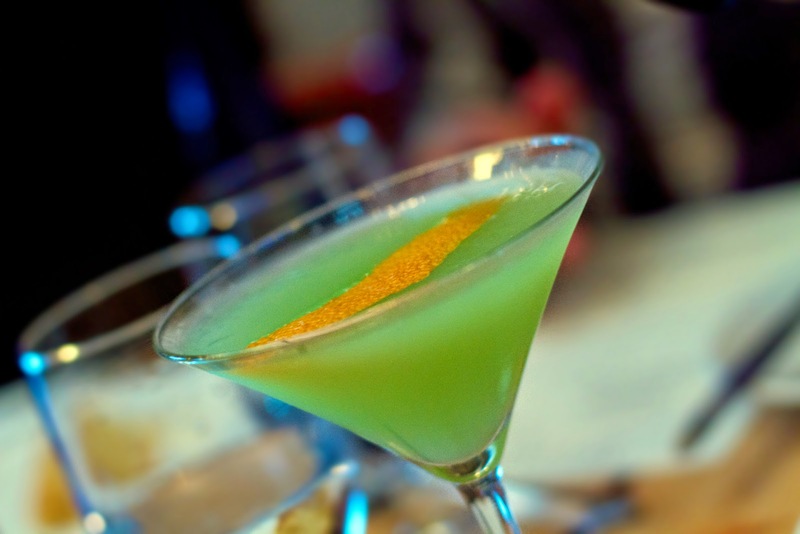 Don't Call Me Shirley featuring housemade citrus vodka, fresh citrus (orange, lemon and lime) juice, and cointreau. This take on a Cosmo was definitely on the stronger side, but we loved the intense burst of citrus. Hawaiian Ahi Tuna Poke with sesame oil, garlic, soy sauce, wakame, black sesame seeds and puffed wonton. I love fresh raw tuna and this was just so fresh. The balance of texture and flavor was spot on. Creamy tuna juxtaposed with the crunchy wonton. Earthy nuttiness of the sesame matched to the freshness of the tuna. It really felt like Hawaii in each bite. Whipped Foie Gras with Caramelized Onion Perogi with red wine pearl onions, chive crema, white truffle and bacon powder. 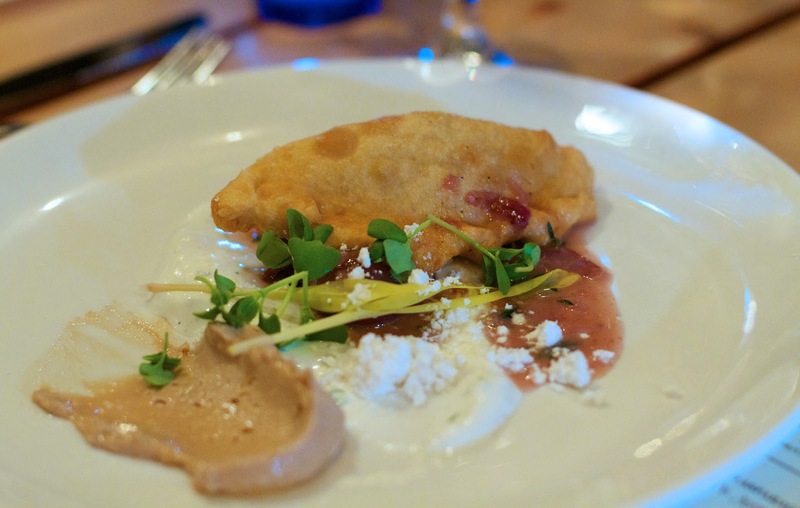 Upon introducing this dish Chef Forrest shared that the perogi recipe came from his grandmother. 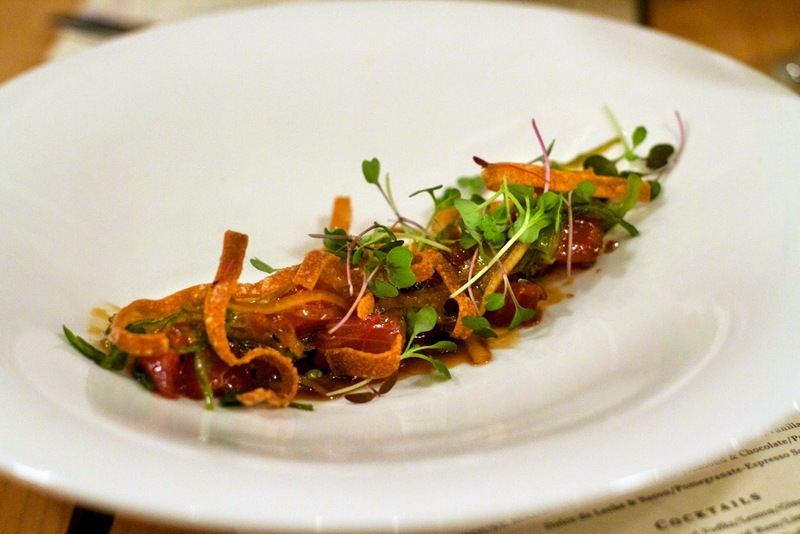 The whipped foie gras was very subtle and the crema provided a fresh pop to the richness of the caramelized onions. 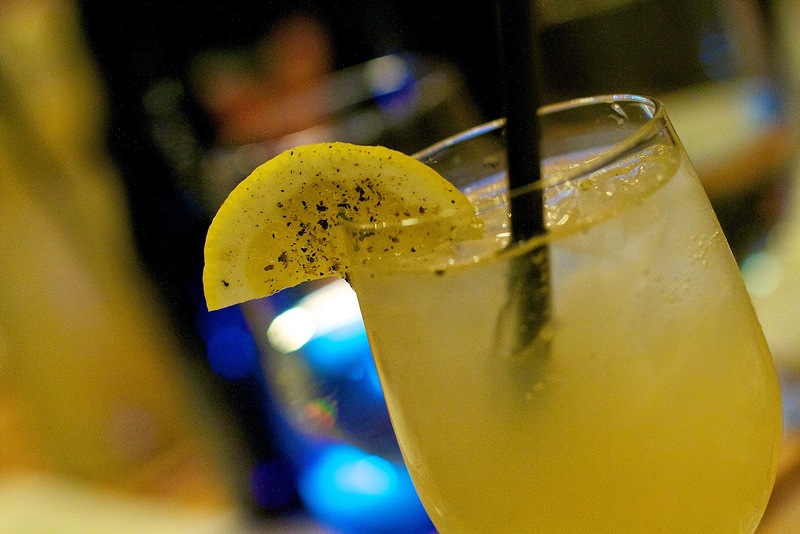 Samuel Clemens made with ginger infused vodka, lemon, ginger, black pepper and club soda. This drink had a really nice peppery bite and slight burn. It was light, effervescent and not too sweet. I declare it my new favorite cocktail for the season. Firecracker Rock Shrimp Scampi with hand cut linguine, diced shallots, roasted garlic and Meyer Lemon. 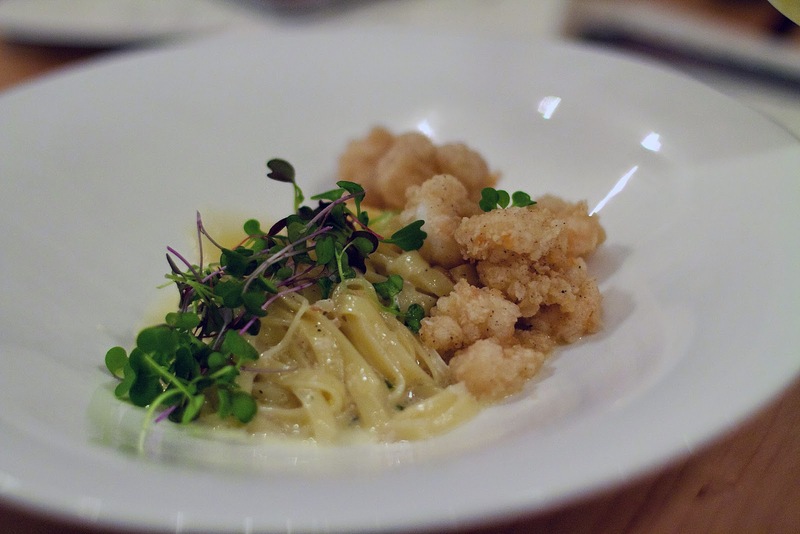 Chef Forrest said this dish was his marriage of popcorn shrimp with traditional scampi. The linguine was delicate and the shrimp crunchy. The Meyer lemon elevated this dish to heavenly. The buttery citrus flavors burst through every bite. I am a good pasta easter and let me tell you, I easily could have housed another bowl of this scampi. Slow Roasted Suckling Pig with yellow corn fritters, lavendar butter, peas and cracklin-red eye gravy. The pig was served to ways. There was an incredibly tender piece of pork shoulder as well as a torchon of the pig rib, cheek, etc. that's then cooked low and slow. This dish was simply slow cooked porky goodness. 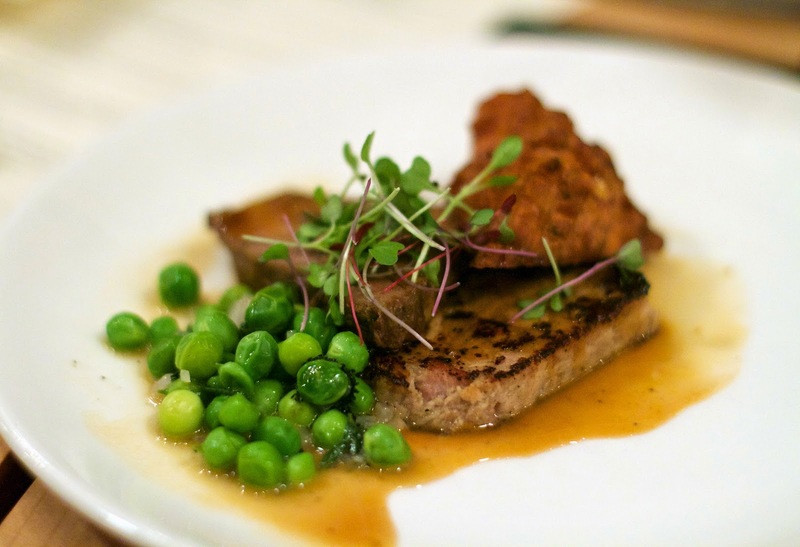 The floral lavendar butter and fresh peas were a nice contrast to the deep, rich flavors of the pork. As if we weren't nearly bursting at the seams, out came two desserts. 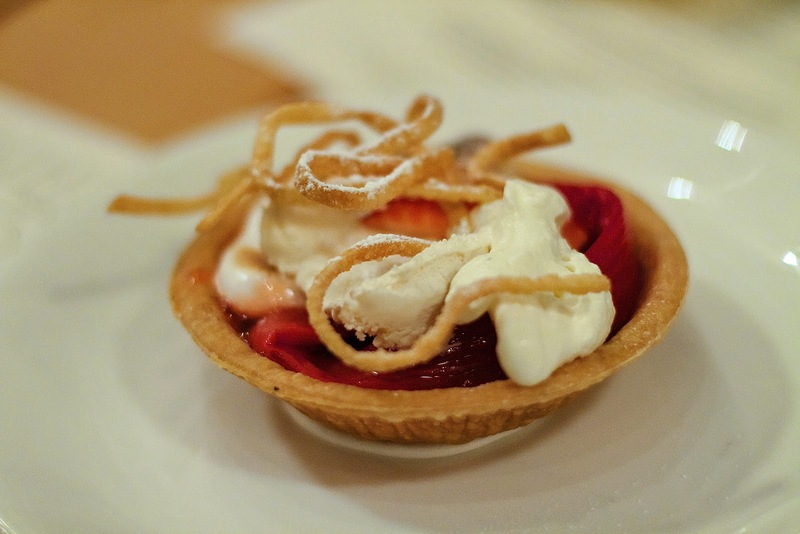 Strawberry + Rhubarb Tart with toasted meringue and Arethusa vanilla ice cream. Strawberry and rhubarb is one of my favorite combinations. I love the tartiness rhubarb adds to any dish. Then, there was "Coffee + Donuts"- Almond + chocolate, powdered sugar, and dulce de leche + bacon all served with a pomegranate-espresso dipping sauce. 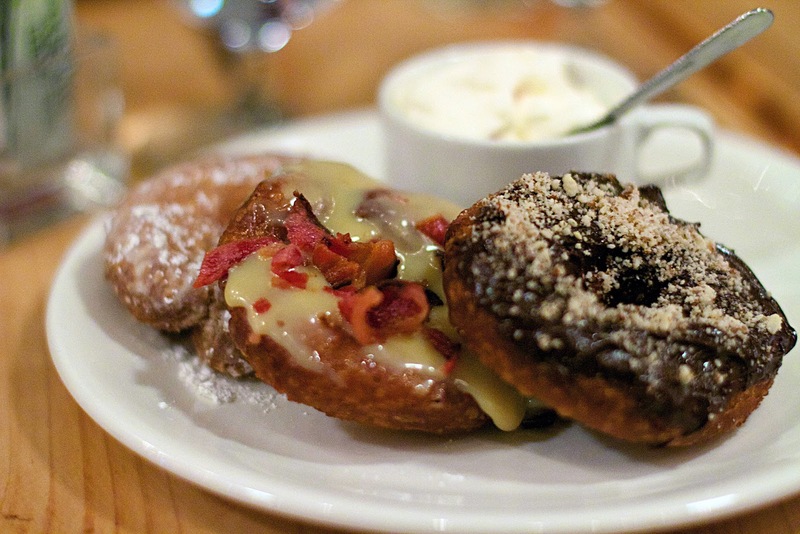 As if you had to ask, yes, I went straight for the bacon donut. That donut is the stuff of my dreams. If you haven't yet been to Bailey's Backyard, get on it already. Spring is here and the flavors await you. It's one of our favorite restaurants no matter the season.